Often called degenerative joint disease or “wear and tear” arthritis, osteoarthritis (OA) is the most common chronic condition of the joints. It occurs when the cartilage or cushion between joints breaks down leading to pain, stiffness, and swelling. 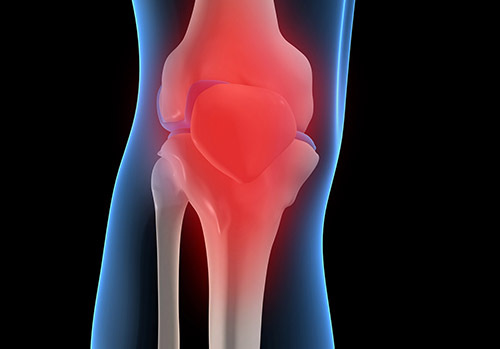 Joint injury may result in posttraumatic osteoarthritis (PTOA). In fact, about half of all people who rupture the anterior cruciate ligament (ACL) in their knee will develop PTOA within 10–20 years of the injury. Moreover, many individuals that develop OA show no signs until significant joint damage has occurred. At that point, the only available long-term treatment options are the surgical replacement of the joint and/or pain management. Unfortunately, the molecular and cellular mechanisms leading to cartilage degeneration or PTOA due to trauma are not well understood. Now, new research from a team of scientists at Lawrence Livermore National Laboratory (LLNL), University of California, Davis, University of California, Merced, and Regeneron Pharmaceuticals has examined whole-joint gene expression by RNA sequencing at 1 day and 1, 6, and 12 weeks after injury. The team used a new, noninvasive tibial compression mouse model of PTOA, which mimics ACL rupture in humans from a single high-impact injury. Identifying OA biomarkers for detecting and tracking the progression of the disease, combined with developing new pharmacologic interventions aimed at minimizing cartilage damage, could personalize medical treatment before the disease hits a point of no return. Most importantly, treatments could be developed that, when administered immediately after injury, would prevent the development of PTOA in the future. “The goal of the study was to see if there are biomarkers associated with cartilage degradation, which could then be further explored as therapeutic targets in future experiments,” explained co-lead study author Jiun Chang, a UC Merced graduate student. The research team identified 1446 genes expressed differentially in injured joints, including several known regulators of OA, as well as a variety of new genes not previously linked to OA. Furthermore, the investigators also identified 18 long noncoding RNAs (lncRNAs) expressed differentially in the injured joints—RNAs that have not yet been explored functionally in this context. “This study provides the first account of gene expression changes associated with PTOA development and progression in this tibial compression model,” noted co-lead study author Aimy Sebastian, also a UC Merced graduate student. The research team was able to employ whole genome expression profiles to obtain new insights into the temporal progression of the disease.